5 Sep / 2018(526)…The Art of bowling. It was during Australia Test tour of South Africa that I noticed a consistent unpredictable movement, both in air and off surface. Host South Africa led by Kagiso Rabada was the best in using this skill. He was well supported by Vernon Philander. I am very certain that both have learned this skill from swing master Dale Styen, their leader. It was back in 2010 during South Africa tour of India that I noticed Steyn get extreme swing and seam. My initial thought – It must be reverse swing, but after observing very closely – I realised Steyn had unconventional grip with late flick of his wrist and that made the ball wobble around and move either way after pitching. Hence I wondered how does one get unpredictable movement ? A cross seam ball wobbles around at certain speed and after pitching movement is unpredictable!. So how does the ball wobble?. If the ball is thrown off from its axis, then there is less and unpredictable swing, – and after hitting pitch it will change its direction depending on turbulence. The key is the grip and how late the bowler is able to release the ball. It is difficult art that require discipline training. The seam angle is seen to be constantly changing as the ball turns… making interesting possibilities for late swing and movement. Wobbling seam is unhelpful to swing but it creates unpredictable movement. The new ball can wobbles more than old ball, because it is light, surface is smooth and shining……..and if there is bit of wind than it can go in any direction, difficult to control. Here is a picture of wobbling seam seen at different stages of the wobble. In the current England v India series all Indian pace bowlers are holding the ball differently, which is very unlike how you grip in England. Unlike English bowlers who were using the conventional grip (unless there is chance of reverse swing) the Indians were getting higher percentage of unpredictable swing!. Interestingly Jasprit Bumrah even with shorten run-up was able to wobble his deliveries and yet maintaining his pace!. To conclude this small post. 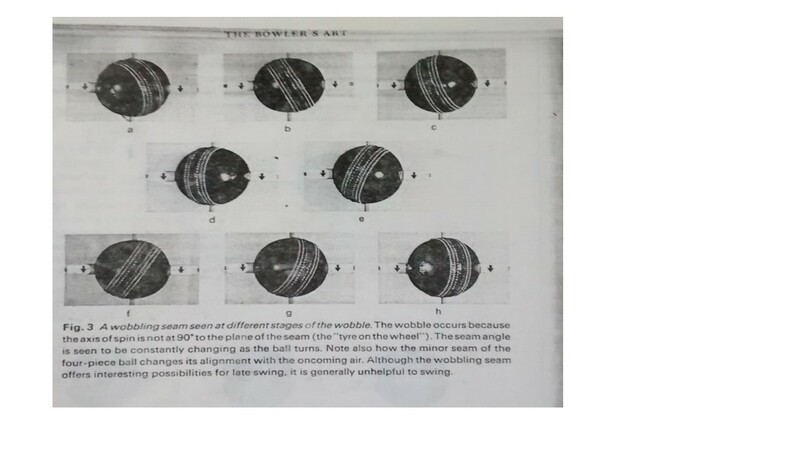 If Test bowlers are able to master this art of movement(by wobbling the ball around) then they have greater chance of picking wickets on any surface. The balance between bat and ball will be maintained.